The morning was quiet and peaceful. Once everyone was awake, bathed and dressed, we had breakfast. 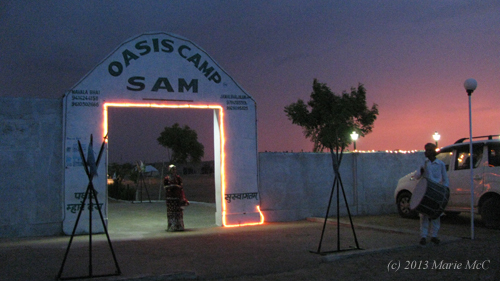 The Sam Camp workers brought plate after plate of aloo paranthas, curd and chai which kept disappearing immediately. Madu had received a call from his business. He was needed back at work as soon as possible, so we would have to cut the trip short. There would be no overnight at Jodhpur this time. 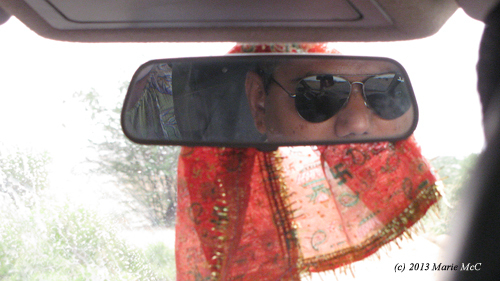 We would have to drive all the way back to Udaipur today. 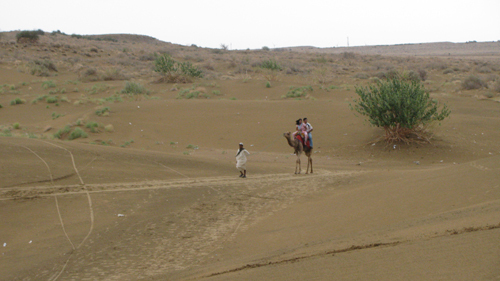 We started out with little else in the landscape but sand and camels. One last desert photo op! It was a long day of driving for Madu. The desert gives way to scrubland. 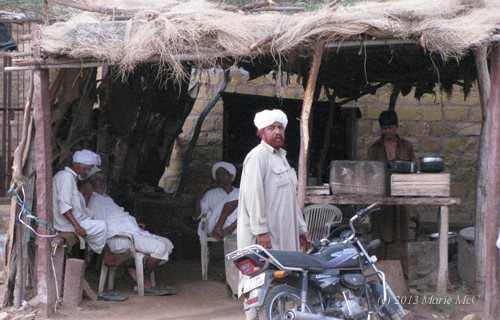 We drove for hours, stopping only in villages for drinks and snacks. 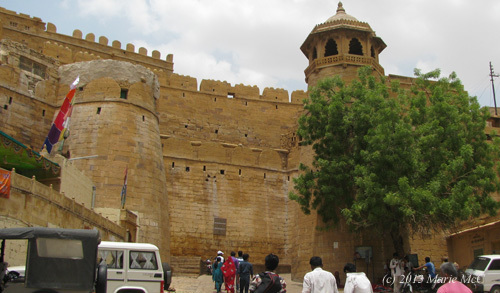 Around 3:00 we reached Jodhpur without having seen a restaurant since breakfast. 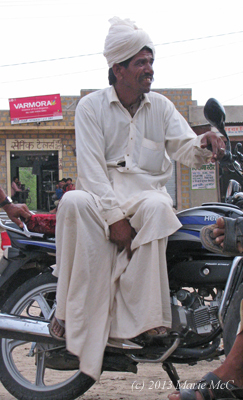 Nirmal needed to meet with a leather bag maker for an hour for business, so we dropped him off there. 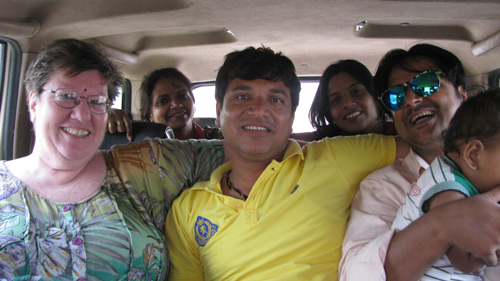 The rest of us would have lunch, order Nirmal some take-out, then we’d get back on the road. 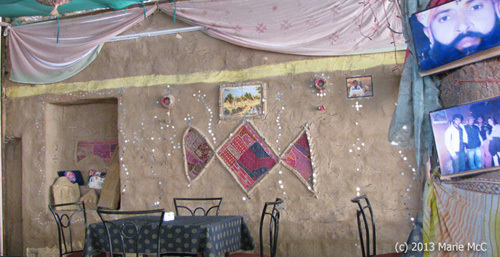 Finding a place to eat in Jodphur again wasn’t easy. We looked up a couple of places which turned out to be closed because it was off season. The ladies wanted a vegetarian lunch. 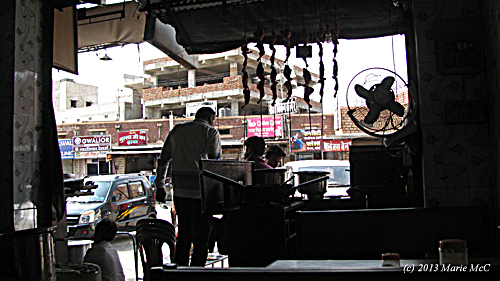 Madu, Pushker and I wanted to go to a locally popular restaurant that specialized in tandoori chicken. After we had located everything with Madu’s GPS, we dropped Rafiq and the ladies at a vegetarian restaurant then returned to the chicken place. Pushker, my hero, persuaded the unwilling restaurant workers to serve us. We encountered problems at the chicken place. Because we were there at 3:00, we were way after the lunch crowd and too early for dinner. The restaurant workers were preparing for the dinnertime crowd and didn’t want to serve us. Pushker had to argue strenuously, beg and finally offer to pay more than the usual price. Reluctantly, they took our order. 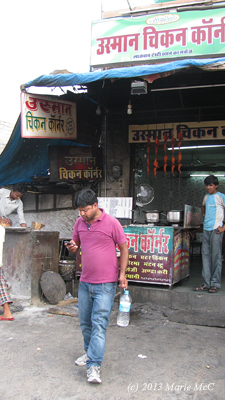 This famous chicken restaurant was a hole-in-the-wall place, little more than street food with two tables. But just because their kitchen was out on the sidewalk was no indicator of lack of quality. The food was FANTASTIC! We were told they didn’t have naan, only roti, but it tasted exactly like naan. Madu, Pushker and I made short work of a pile of roti and two tandoori chickens. When we picked up Nirmal, he was so hungry he polished off another one almost by himself. The rest of the day was uneventful. We rolled into Udaipur at around 11:30 p.m.
My friends were the easiest people to travel with and the best travel companions you could ever hope for. There was no friction, no fussiness, no complaining. There was lots of laughing, singing and enjoyment of each other’s company. It was like a nonstop party, which is what it’s like to be around them any time. It was the best road trip ever. 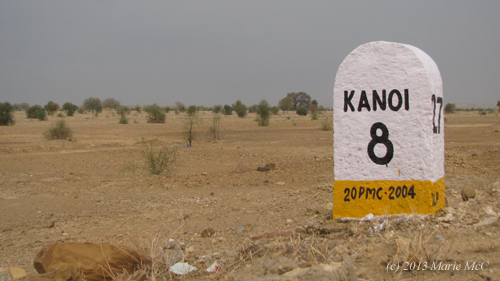 Out in the middle of nowhere, 8 kilometers from nowhere. 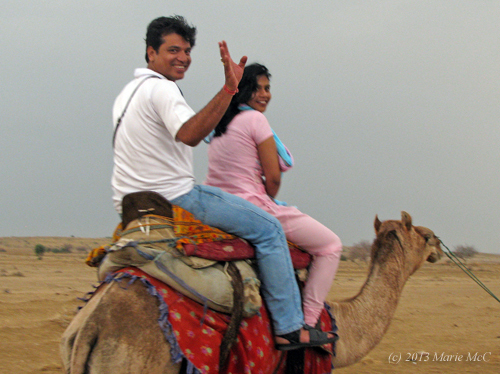 Our destination was a camp near Sam Sand Dunes in the Thar Desert. 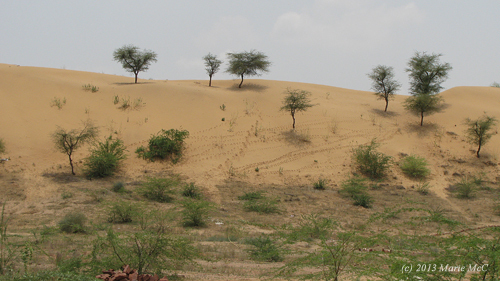 Not long after leaving Jaisalmer, we were surrounded by desert landscape. 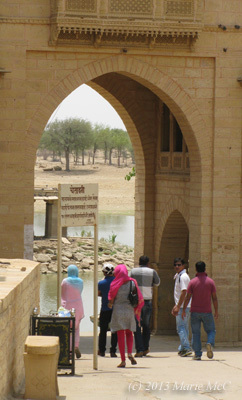 But surprisingly, it was less hot than it had been in Jaisalmer. 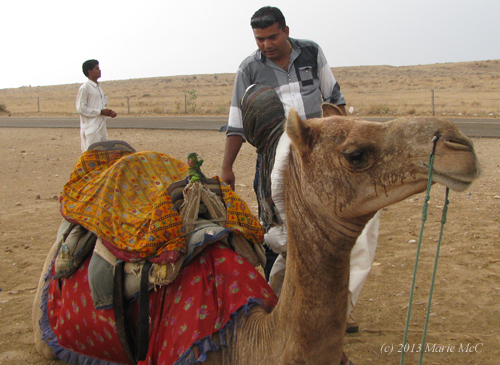 Madu, former camel boy, inspects his mount. 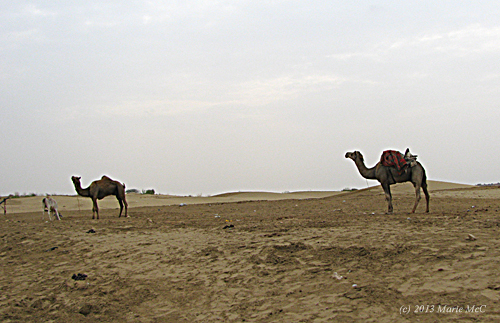 The drive wasn’t long to the spot where our rented camels awaited. Again I passed on the small, hard camel saddle and opted for the camel cart. Bharti and Mohit came on the cart with me, while Nirmal ran alongside for awhile taking pictures. 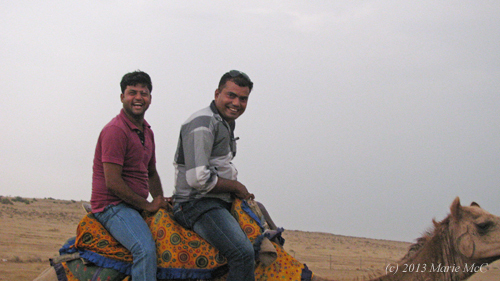 Riding camels: more fun than a barrel of attacking monkeys. Even way out here, there were tire tracks and trash. It’s hard to find an unspoiled place anywhere in the world these days. I don’t care much for the desert. But we were here in the late afternoon, the best time of day for pictures. With a storm rolling in and the pinkish hues of sunset, some of it was pretty. One day Pushker will overcome his pathological shyness and become more flamboyant. 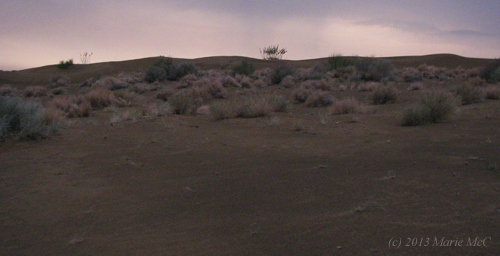 After horsing around on the dunes, we reached the Sam Camp in the last moments of light. It was so beautiful, we should have been in a movie! 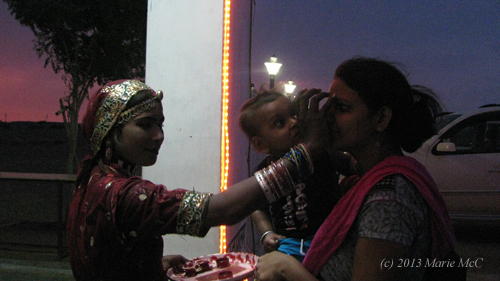 Shahi, Bharti and I were welcomed with the placement of a tilak on our foreheads. 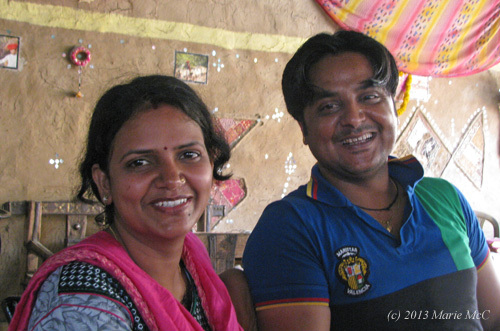 Mohit was a little worried, wondering what that woman was doing to his mother. 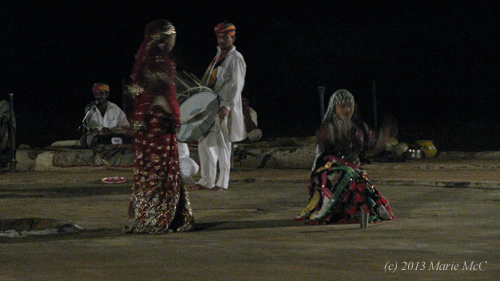 There was a halfhearted music and dance performance. The dancers kept stopping and starting, for reasons known only to themselves. It started to rain about five minutes into the performance, putting a complete stop to it. Dinner was good. I don’t remember what we had, other than a good time. We had brought our own beer and stayed outside drinking and laughing after the rain stopped. The guys knew that there wouldn’t be any available out here. They thought of everything! The other camp guests had gone to bed after dinner. We were the only ones who had stayed out after the rain stopped, most likely because we were the only ones with beer. Since we were still outside hanging out and because the musicians knew Rafiq, they and the dancers came back and did a performance just for us! 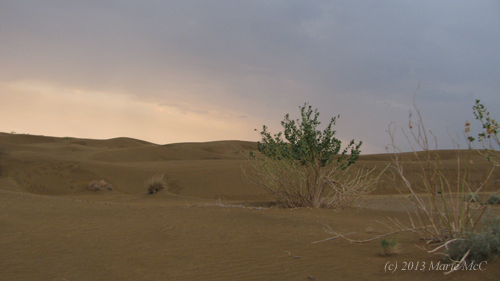 Some desert camps provide tents as sleeping quarters. Tents can be impractical when it rains or gets really windy, so this camp built cabins. My women friends will want to know: the cabins were plumbed and had flush toilets. (The public toilets out by the stage were squat toilets.) The shower, however, didn’t have enough water pressure so I had to take a bucket bath. The cabins had no air conditioning, only fans. It was too hot inside the cabins, so we slept outside on cots brought to us by camp employees. I couldn’t believe anyone would need a blanket. Since I’m used to much colder temperatures and it was still fairly warm out there, I didn’t even want one touching me! The sky was still cloudy so there weren’t any stars to wish on, but it was still fun sleeping outdoors. 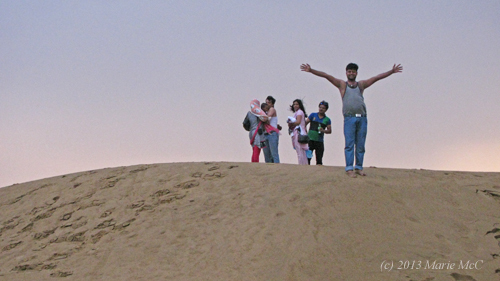 We spent the night at Sohan Deep, a brand new hotel that was still under construction. 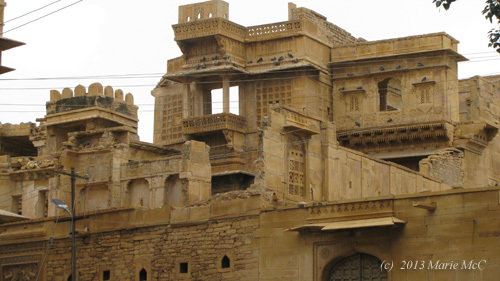 It was just down the hill from the fort and across the street from my favorite Jaisalmer restaurant. 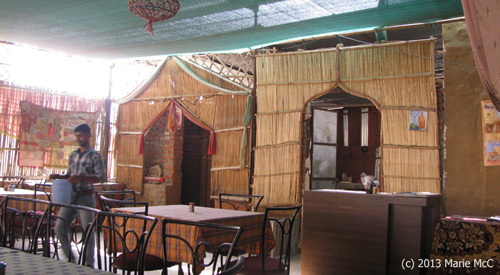 The Kebab Corner had remodeled and changed its name to the Royal Rasoi. The food was as good as I remembered, and everyone was delighted with their meal. Rafiq said it was much less expensive than the wretched “resort” place where we’d had lunch the previous day. 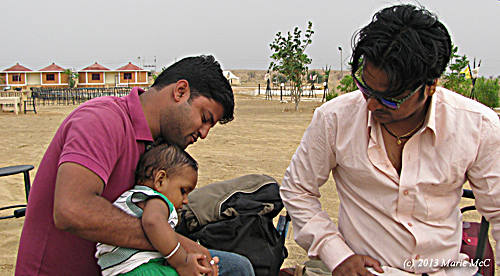 After a substantial breakfast of scrumptious aloo paranthas, we headed for Gadisagar Lake. It must have been well over 100 degrees. I had to cover my head and neck with a cotton shawl to keep from getting instant sunburn. Within seconds of leaving the car, I could feel sweat running down the back of my legs. It was physically uncomfortable, but at least this time there were no touts stalking me with leather hats. Rafiq, always looking out for me, checking to see where I am and if I’m ok. The water level was really low. We dropped pieces of bread into the water for the fish. The water was so murky, you couldn’t ever see any of them. There was just a “bloop” sound once you dropped the bread, the water would swirl, then the chunk of bread would disappear. 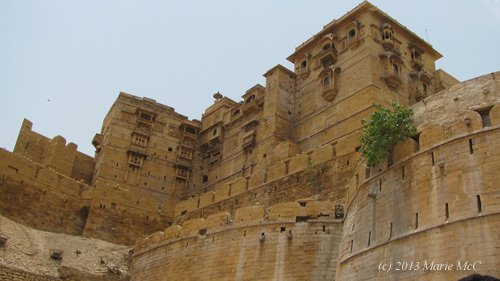 Sonar Qila, the Golden Fort, was next. Soon after we got there, after climbing one brief flight of stairs, my heart was pounding, I couldn’t catch my breath, and I felt dizzy. I was glad I’d toured the fort two years ago. There was no way I could do it this day. I begged off the fort tour that everyone was going on, and Rafiq, who had seen the fort several times before, stayed behind to look after me. 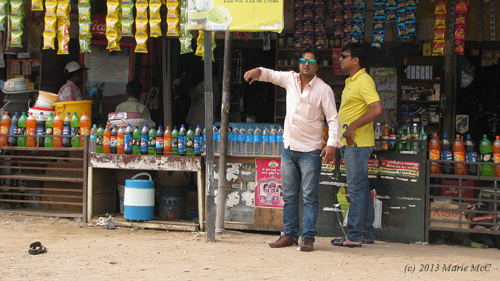 We rested in the shade a bit then found a shop selling cold soda and juice. Just across from the shop was a temple with a pair of faucets which people could use to wash up before going inside. There were some large cups on a chain near the faucets. I went over and splashed some water on my face. It turns out the water was chilled, so I filled up one of the cups and dumped it over my head. “That might be a problem for you,” Rafiq said. I thought he meant that I had just committed a social blunder, but it turned out that he thought the cold water might make me sick. Indians often won’t drink refrigerated soda or beer until it’s room temperature because they think it will give them a cold! I explained to Rafiq that if a person is about to suffer heat stroke, which I thought could be a real possibility, that cold water on the head was actually a good thing to do. After dumping the cold water on my head and downing most of a liter bottle of mango juice, I began to feel better. 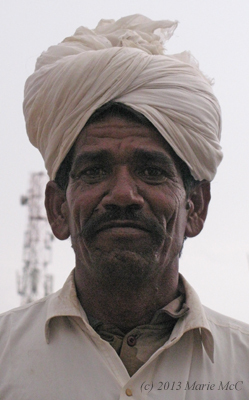 I returned to the faucet and poured another cup over my head, then doused the front and back of my salwar as well. I didn’t care if I looked like a drowned rat. It was so hot that I wouldn’t stay wet for long. When the group finished the fort tour, we adjourned for lunch to the supposedly air conditioned restaurant next door to the Royal Rasoi. The AC didn’t work very well, but it was much better than not having it. After a very leisurely and long lunch, we piled back into the car and headed south. We were going to spend the night in the desert. 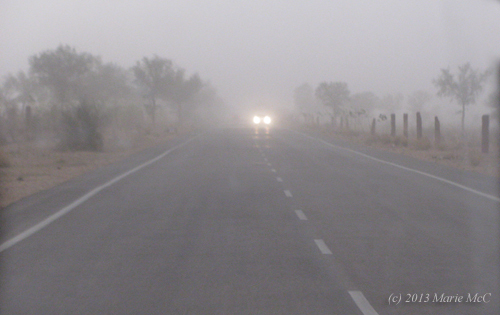 From Osian we continued northwesterly on our way to Jaisalmer. Occasionally we would stop for something to drink or a bathroom break. Whenever we did, I’d look around to see if there was anything interesting to take a picture of from my seat in the car. It was too hot to keep jumping out for photos. 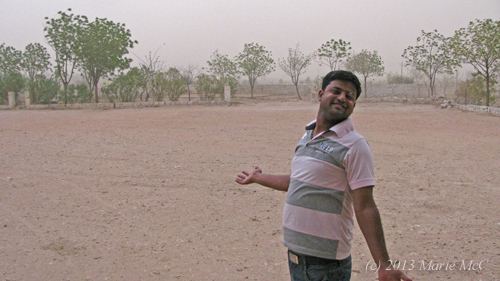 A camera-shy Pushker getting exfoliated from the grit blowing by during the haboob. After a long stretch without seeing any town, village or anyplace serving food, we finally found a place describing itself as a “resort,” which had a restaurant. 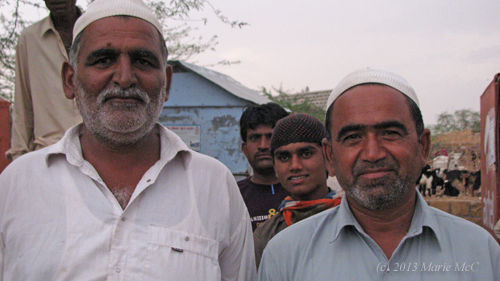 It had been recommended to Rafiq as being the place where all the tourist buses stopped. They may have stopped there only because there was no other choice. The food wasn’t good at all. As we were about to leave, a strong wind kicked up and suddenly the temperature dropped about ten degrees, from baking to almost comfortable. 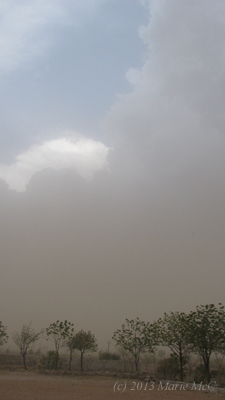 A haboob (Arabic word for huge dust storm) was blowing through, turning the sky beige. The haboob shrouded everything in a ghostly, gritty haze. We took off and motored through the ghostly, gritty haze. The atmosphere in the car had quieted down. We had been laughing and singing the whole way, but now we were getting tired. 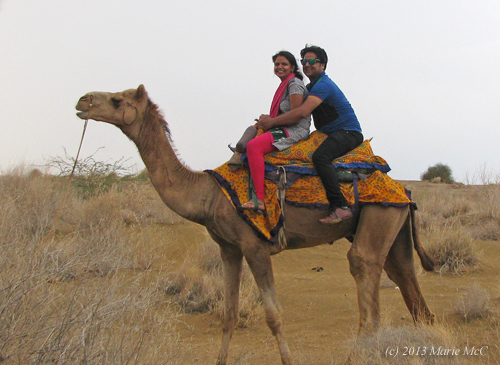 We were still five or six hours away from Jaisalmer, where we would spend the night. We rolled through another nameless, trash strewn village, just a line of shops where people congregated out of boredom. A villager gazes at us with listless curiosity. Madu pulled over suddenly and got out. We had a flat tire. 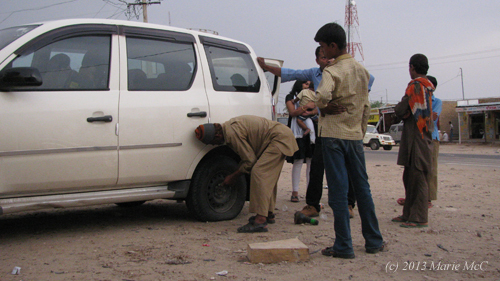 Across the road there was a tire repair shop with a cluster of bored Muslim men sitting around. We pulled in over there. In soul crushing places like these where life is hard and there’s nothing to do, anything attracts attention. 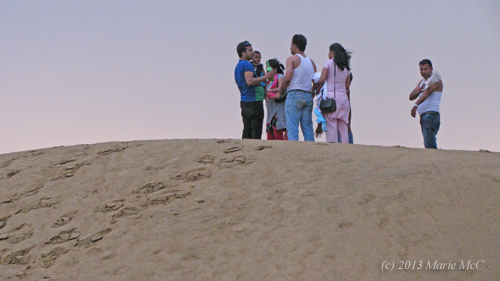 I was quietly observing the group of men who were gathered there. 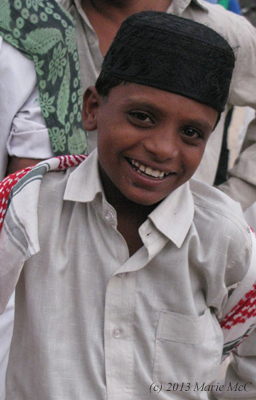 There were plenty of interesting faces, and I wanted to start taking pictures. I usually like to break the ice by talking to people first, but it’s not recommended that a strange woman strike up a conversation with village men. They take anything as a sexual overture. Even though I was much less at risk because I was with a group, and my three male friends were only steps away, it didn’t seem like a good idea to start chatting up these guys. 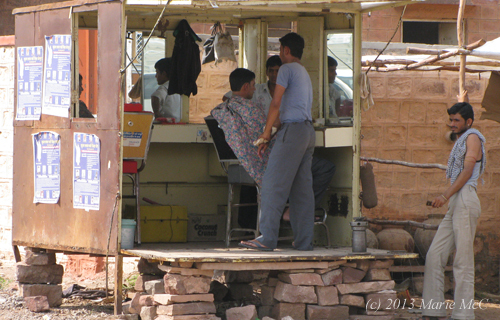 Plus we were in a remote place, and I guessed there probably wasn’t a lot of English spoken here. I go with my gut. The only thing to do was to try to surreptitiously snap a few shots and hope like hell I didn’t offend anyone. This guy caught my interest, but he was looking away. This was exactly the shot I was hoping to get! 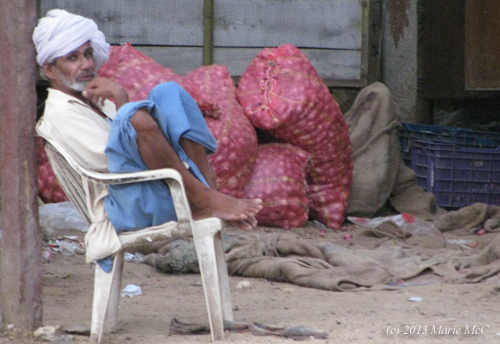 As soon as I snapped these shots, the men nearby hollered out to the man on the motorcycle in Arabic. Or it could have been Mewari, Punjabi or any of a dozen non-English languages spoken around here. I only knew it wasn’t Hindi. I also knew they were telling him I had taken his picture because they were pointing to me and my camera. A half second of suspense… but wait, they were smiling! 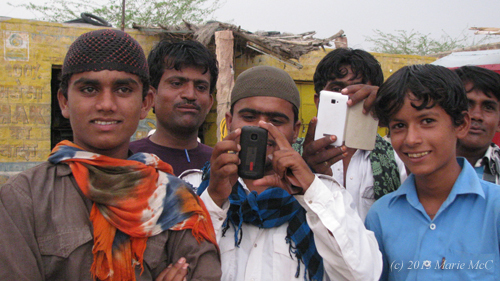 I showed them the photo on my camera screen and instantly made 20 new friends! Now they were asking me to take their pictures. Always fun to take pictures of them taking a picture of me. It didn’t occur to me until much later to wonder why they were so excited to get their pictures taken, like it was some novelty, when there were guys who lived there who had cameras on their phones. Maybe they thought they had a better chance of getting a copy from a “rich” foreigner. They’re probably right. Me and my village homies. 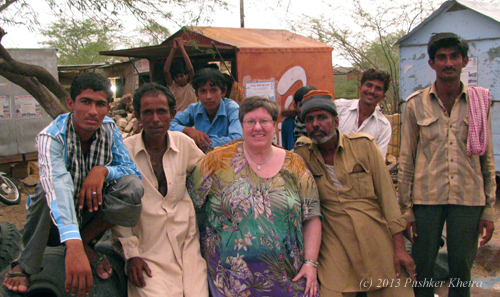 Twenty minutes later, with the tire repaired, I waved goodbye to my new home boys, and we continued on to Jaisalmer.